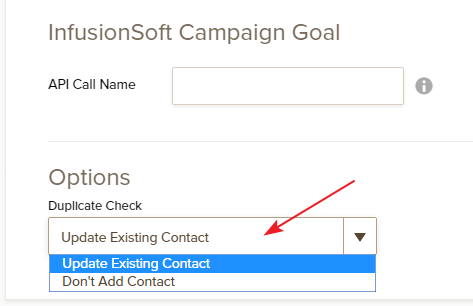 How to keep updating the same contact card in infusionsoft when submitting multiple forms? while I have accomplish the first step, I am wondering if there is a way to update this one contact card that is just created throughout the campaign when clients or supplier submit multiple subsequent forms. e.g. a prefilled field in the 2nd jotform (a different form) to be the newly generated email address (random value) so that the same contact card can be updated with other info such as uploaded files, additional information and etc. I am not sure if I understand your query correctly. If the form receives a submission with the same email address, the contact can be updated by using the option Duplicate check in the integration wizard. By choosing Update existing contact, the submission received will be updated if the email address is the same. If the email address is a different one, Infusionsoft will be creating a new contact automatically. please. when I tried to use URL parametres to lock the email address (e.g. thanks for the prompt assistance, problem solved, however a side question please. when I tried to use URL parametres to lock the email address (e.g. prefill the form with the same email address and make the field invisible so that the user cannot change the value upon submission), it seems that only when the client clicks the direct link (with merge field in infusionsoft), the form email address can be locked as requested (see screenshot here: http://screencast.com/t/0KpCjQEkPer ). but when I copy and paste the link to put it as a URL link (button-click URL at infusionsoft, see the screenshot here: http://screencast.com/t/g1kuPNht ) or directly create a URL link for the same matter, the form at JotForm will not be updated with prefilled field as requested, any chance you may be able to help me out here too? PS: sometimes when I use the prepopulate.jotform.io to generate the URL parametres, some fields (particularly the invisible field) were dropped off even though I write it into the URL parametre manually, any reasons? Sorry about my wordy question, appreciate your help in advance. Glad to see that the existing contact issue is resolved. The other question is moved to a separate thread and shall be addressed there shortly. Kiran, can you help me with my infusion soft issue? I see that there is a thread that you have created regarding infusionsoft. We're sorry for this delay. We'll give you a response as soon as possible.